As a foodie, I constantly trawl food blogs, online forums and mobile food apps in search for hidden gems around me. But despite the plethora of foodie recommendations for those able to eat just about anything, foodie finds for those with dietary restrictions are few and far between. As such, I’ve had Muslim friends, especially those in Singapore on vacation, asking for recommendations for places serving good Halal food in Singapore. For these people, the guys at HalalTrip hear you, and as such have designed the new app to do just that. 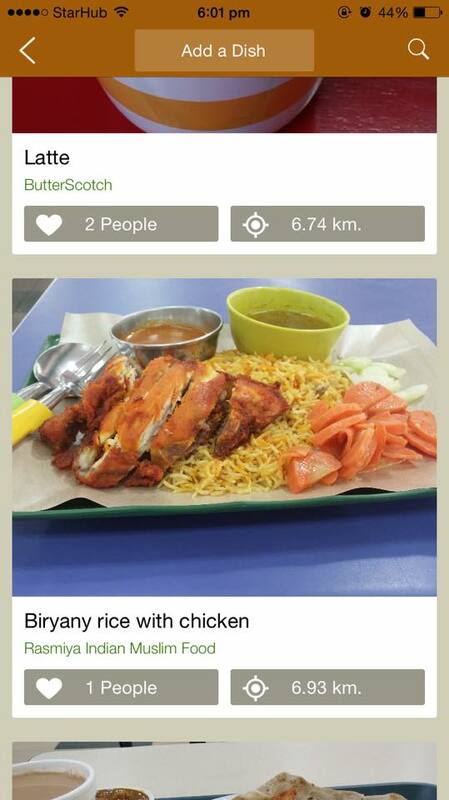 The Singapore-based company launched a mobile application of the same name on Wednesday to enable Muslim foodies to share Halal food finds all around the world. 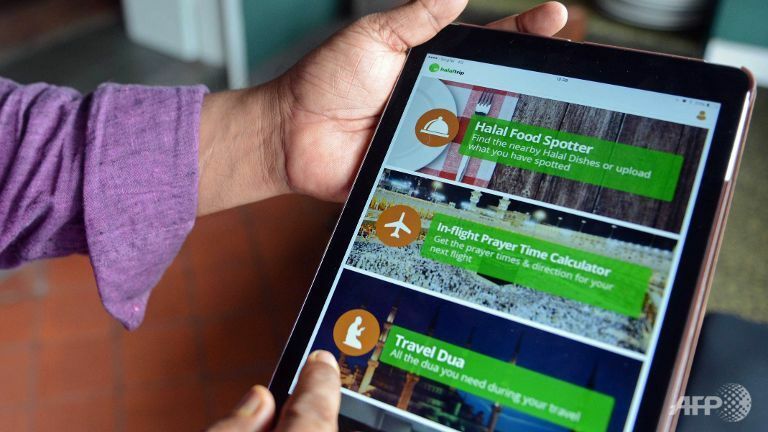 The app appears to target the Muslim traveller especially, and on top of its food recommendation function, the app boasts of an in-flight prayer time calculator and a set of Travel Dua (prayers), with an upcoming function that even allows users to book hotels through the app. The company also has a complementary website. 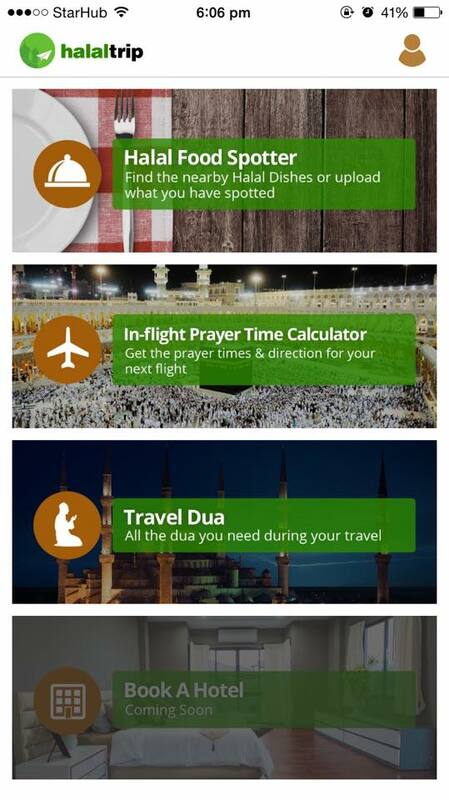 The HalalTrip app is free, and is available for both iOS and Android devices. “Halal” refers to food, products and services that comply with Islamic requirements. Fazal predicted the Muslim travel market would be worth $192 billion a year globally by 2020, up from $140 billion in 2013. Even when not travelling, Muslims here also agree that there are not enough Halal food discovery platforms in the market, though no lack of a demand. These sentiments were echoed by Adam Shah and his wife Maryah, the couple behind The Halal Food Blog, a popular local food blog for Singaporean Muslims in search for Halal food recommendations. The Halal Food Blog now receives an average of about 7,000 views overall per day, so there’s certainly a demand in Singapore itself for a Halal food recommendation system. We took HalalTrip for a spin, to see how effectively the app meets this very demand. The app has both English and Arabic interfaces, and requires users to register with either their emails or Facebook accounts to use most of its functions. 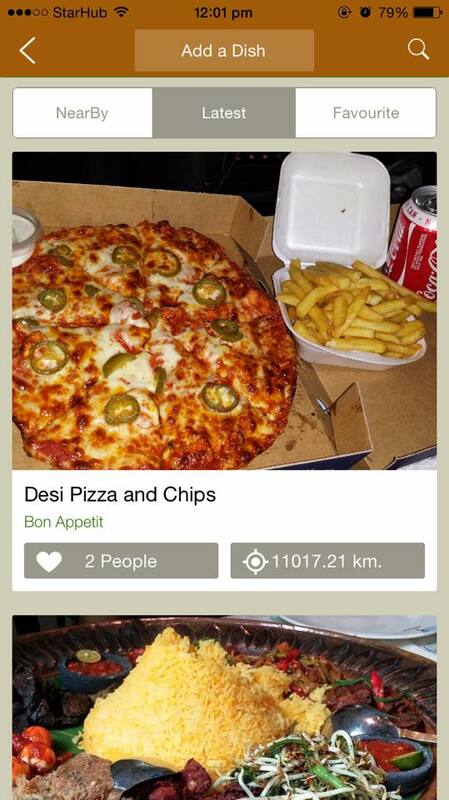 The Halal Food Spotter is the app’s main function for now, and allows users to share food recommendations from all around the world. 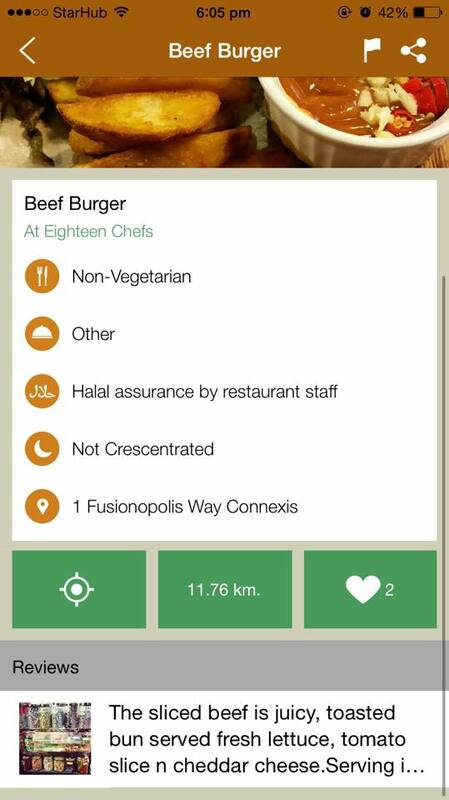 The interface is familiar to social media platforms, with a feed for Halal food reviews nearby as well as the latest reviews as they are being uploaded. A “like” function also doubles as a bookmark for interesting food finds for future reference, which will be compiled under “Favourite”. Upon clicking on a food review, users will see more details of the review, including the location of the restaurant, whether the restaurant is vegetarian, and its official Halal certification, if any, and a short comment from the reviewer. The review can also be shared via certain media platforms such as by mail, on Whatsapp, Twitter, and Pinterest. Users can also upload these images and reviews by tapping the “Add A Dish” icon on top of the page, or search for a particular dish by tapping the magnifying glass icon. The platform however lacked many of the functions commonly seen on other food review platforms, the first of which being a star point system where users can see the reviewer’s ratings of the restaurant and/or food at a glance without having to click on reviews individually to see the reviewer’s assessment of the food there. Although not an original idea, I feel that it would greatly simplify things for its users. Another function missing was the ability for other users to comment on reviews, something I find useful when seeking different opinions about the place, or even for users to update the status of the restaurant, such as if it has shifted, etc. The only way around this right now, I believe, is to upload another review from the same location, which seems to me highly inconvenient. For thrifty eaters like myself, it would also be very helpful should there be a cost estimate of the restaurants reviewed, which allows me to gauge if the restaurant is worth a visit, or fits into my meal budget. Finally, the interface still appears a little clunky to me. For example, the “Add A Dish” button looks deceivingly like part of the Search function, being a bar situated right beside the familiar magnifying glass. It took me awhile to get used to tapping directly on the magnifying glass instead, moving on to a next page specifically for searches, and finally being able to type in my desired dish. This is certainly an area that could be further streamlined. We also tried out the other functions of the app. The Travel Dua was seamless, and travelling Muslims might find the prayers useful and its accompanying audio clips comforting while on their trips. The in-flight prayer time calculator proved rather clumsy though; the app simply crashed every time we tried entering flight timings, so much so that we gave up testing the function altogether. Gripes aside, I believe that the app has great potential in the burgeoning Muslim market. The concept is great, and pulls specific information traditionally found on a wide variety of sources such as Google, Instagram, and regular food recommendations sites, into a single app. (A quick check with my Muslim friends revealed that they currently search for Halal food places through food blogs such as the above-mentioned, on Instagram with the hashtags #halal or #halalfood, on Burpple’s Best Halal Restaurants, or simply through a quick Google Search). There is however much to be desired from the execution of the concept, but we don’t blame them either, given its recent launch in the market. It certainly is an app to look out for once the bugs are fixed and it starts gaining traction in the region and around the world.